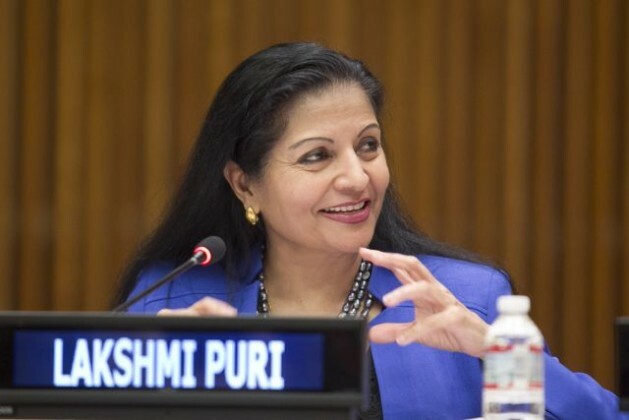 UNITED NATIONS, Aug 17 2015 (IPS) - The efforts of the United Nations and the global women’s movement to promote the women’s rights agenda and make it a top international priority saw its culmination in the creation of U.N. Women, by the General Assembly in 2010. UN Women is the first – and only – composite entity of the U.N. system, with a universal mandate to promote the rights of women through the trinity of normative support, operational programmes and U.N. system coordination and accountability lead and promotion. This is a pivotal moment for the gender equality project of humankind. It also supports the building of a strong knowledge hub – with data, evidence and good practices contributing to positive gains but also highlighting challenges and gaps that require urgent redressal. UN Women has given a strong impetus to ensuring that progressive gender equality and women’s empowerment norms and standards are evolved internationally and that they are clearly mainstreamed and prioritised as key beneficiaries and enablers of the U.N.’s sustainable development, peace and security, human rights, humanitarian action, climate change action and World Summit on the Information Society (WSIS) + 10 agendas. In fact, since its creation five years ago, there has been an unprecedented focus and prioritisation of gender equality and women’s empowerment in all normative processes and outcomes. With the substantive and intellectual backstopping, vigorous advocacy, strategic mobilisation and partnerships with member states and civil society, U.N. Women has contributed to the reigniting of political will for the full, effective and accelerated implementation of Beijing Platform commitments as was done in the Political Declaration adopted at 59th session of the Commission on the Status of Women; a remarkable, transformative and comprehensive integration and prioritisation of gender equality in the Rio + 20 outcome and in the 2030 Agenda for Sustainable Development through a stand-alone Sustainable Development Goal and gender sensitive targets in other key Goals and elements. Additionally, there was also a commitment to both gender mainstreaming and targeted and transformative actions and investments in the formulation and implementation of financial, economic, social and environmental policies at all levels in the recently-concluded Addis Accord and Action Agenda on Financing For Development. Also we secured a commitment to significantly increased investment to close the gender gap and resource gap and a pledge to strengthen support to gender equality mechanisms and institutions at the global, regional and national levels. We now are striving to do the same normative alchemy with the Climate Change Treaty in December 2015. Equally exhilarating and impactful has been the advocacy journey of U.N. Women. It supports and advocates for gender equality, women’s empowerment and the rights of women globally, in all regions and countries, with governments, with civil society and the private sector, with the media and with citizens – women and girls, men and boys everywhere including through its highly successful and innovative Campaigns such as UNiTE to End Violence against Women / orange your neighbourhood, Planet 50/50 by 2030: Step it up for Gender Equality and the HeforShe campaign which have reached out to over a billion people worldwide . UN Women also works with countries to help translate international norms and standards into concrete actions and impact at national level and to achieve real change in the lives of women and girls in over 90 countries. It is in the process of developing Key Flagship Programs to scale up and drive impact on the ground in priority areas of economic empowerment, participation and leadership in decision making and governance, and ending violence against women. Ending the chronic underinvestment in women and girls empowerment programs and projects and mobilising transformative financing of gender equality commitments made is also a big and urgent priority. We have and will continue to support women and girls in the context of humanitarian crisis like the Ebola crisis in West Africa and the earthquake relief and response in Nepal and worked in over 22 conflict and post conflict countries to advance women’s security, voice, participation and leadership in the continuum from peace-making, peace building to development. UN Women’s role in getting each and every part of the U.N. system including the MFIs and the WTO to deliver bigger, better and in transformative ways for gender equality through our coordination role has been commended by all. Already 62 U.N. entities, specialised agencies and departments have reported for the third year on their UN-SWAP progress and the next frontier is to SWAP the field. Much has been achieved globally on women’s right from education, to employment and leadership, including at the U.N. Secretary-General Ban Ki-Moon has appointed more senior women than all the other Secretary-Generals combined. Yet, despite the great deal of progress that has been made in the past 70 years in promoting the rights of women –persistent challenges remain and new ones have come up and to date no country in the world has achieved gender equality. The majority of the world’s poor are women and they remain disempowered and marginalised. Violence against women and girls is a global pandemic. Women and girls are denied their basic right to make decisions on their sexuality and reproductive life and at the current rate of progress, it would take nearly another 80 years to achieve gender equality and women’s empowerment everywhere, and for women and girls to have equal access to opportunities and resources everywhere. The world cannot wait another century. Women and girls have already waited two millennia. The 2030 Agenda for Sustainable Development and all other normative commitments in the United Nations will remain ‘ink on paper’ without transformative financing in scale and scope, without the data, monitoring and follow up and review and without effective accountability mechanisms in this area. As we move forward, the United Nations must continue to work with all partners to hold Member States accountable for their international commitments to advance and achieve gender equality and women’s empowerment in all sectors and in every respect. UN Women is readying itself to be Fit For Purpose but must also be Financed For Purpose in order to contribute and support the achievement of the Goals and targets for women and girls across the new Development Agenda. This is a pivotal moment for the gender equality project of humankind. In order to achieve irreversible and sustained progress in gender equality and women’s empowerment for all women and girls – no matter where and in what circumstances they live and what age they are, we must all step up our actions and investment to realise the promise of “Transforming our World ” for them latest by 2030. It is a matter of justice, of recognising their equal humanity and of enabling the realisation of their fundamental freedoms and rights. As the U.N. turns 70 and the entire international development and security community faces many policy priorities – from poverty eradication, conflict resolution, to addressing climate change and increasing inequalities within and between countries – it is heartening that all constituents of the U.N. – member states, the Secretariat and the civil society – recognise that no progress can be made in any of them without addressing women’s needs and interests and without women and girls as participants and leaders of change. By prioritising gender equality in everything they pledge to not only as an article of faith but an operational necessity, they signal that upholding women’s rights will not only make the economy, polity and society work for women but create a prosperous economy, a just and peaceful society and a more sustainable planet.